Matt Damon | No Chic. Just Geek. ‘No imprint lingers so indelibly on the face of modern fantasy film as that of this obscure yet brilliant artist. All his films, no matter how tawdry, were marked with a brilliant personal vision,’ wrote the Australian critic and novelist John Baxter, referring to the American director Jack Arnold. There is, indeed, no reason for normal people to have any idea who Arnold was, but for the fact that he was responsible for some of the most vivid and memorable SF and fantasy films of the 1950s – films which are still hugely influential, to judge from the fact that The Shape of Water, currently enjoying thirteen Oscar nominations, seems to owe a distinct debt to Arnold’s Creature from the Black Lagoon, and Alexander Payne’s Downsizing likewise seems to have very much been made under the influence of Arnold’s The Incredible Shrinking Man. Can a remake of Tarantula by Werner Herzog be very far off? Downsizing stars Matt Damon as Paul Safranek, a mild-mannered occupational therapist who is as surprised as everyone else when Norwegian scientists announce they have discovered the secret of ‘cellular reduction’ – a process where living creatures can be permanently and irreversibly shrunk, without suffering any ill-effects in the process. The benefit of this to the planet is an enormous reduction in the resources they consume and the waste they produce. The personal advantage to the shrunken folk is that their money stretches much further, allowing them to enjoy a luxurious standard of living within the sealed communities in which they live. 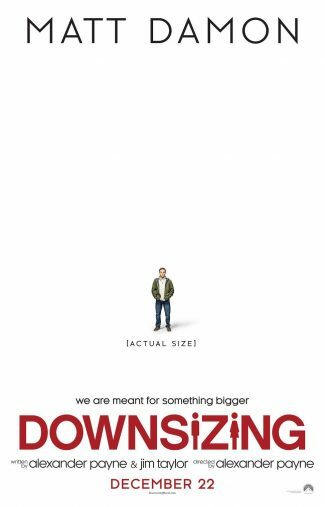 Alexander Payne may not personally have the secret of miniaturisation, but he certainly seems to have figured out how to polarise an audience: Downsizing is one of those films which seems to have received a very lukewarm reception, judging by the critical aggregation sites. Looking a little closer indicates that this is one of those films which people seem to love or hate in pretty much equal numbers. I can understand why some people might respond negatively to this movie: beyond the fact that it’s obviously a science fiction film, it’s quite difficult to say with complete certainty what kind of story it is telling. Is it a satire? Is it pure comedy? Is it a drama? Is it something more philosophical? Certainly at times it seems to be all of those things. The lengthy running time is also probably an issue, especially when coupled to the apparent lack of focus: negative reviews of this movie often include words like ‘rambling’ and ‘meandering’. I have to say that I am in the other camp, and found Downsizing thoroughly enjoyable and absorbing entertainment, not least because of the way it defies easy categorisation, beyond SF. Now, I have to say that as actual serious science fiction the movie is on very shaky grounds. While the script quite sensibly declines to go into the details of just how cellular reduction works, I’m still pretty sure that if you did shrink someone down to roughly 0.03% of their natural size, not only would they have severe difficulty in maintaining their body temperature without constantly snacking, they would also be unable to breathe (their lungs would be unable to process the now relatively-giant air molecules). Once you get past that, however, this is an impressive and rather commendable attempt at a proper piece of genuine SF. One of the reasons for the unusual structure of the film is that it takes a particular concept – in this case, the notion of human shrinking – and explores it in a relatively systematic and comprehensive way. Just how would the world be changed? The film eschews the action-horror staples generally associated with size-change in SF and thinks in wider terms – how would it affect society? How could the technology be used and abused? (Despots start shrinking dissidents, for instance, who then start trying to enter the USA via some fairly unusual routes.) Once again, the economics as posited by the movie strike me as a little wonky, but I am prepared to cut it some slack: very often, SF ideas in films come with a single metaphor baked in, which the film then laboriously articulates over and over. Downsizing treats the shrinking process as a piece of technology, rather than a metaphor-made-real, and one of its most drolly amusing sequences is the one in which we see Damon being processed – exactly how the mass-miniaturisation of new residents takes place has been worked out in some detail. The question is rather one of what the process reveals or illuminates about the human condition and our society in general, and the shift in perspective is enough to make one see the situation inside the shrunken colony in a new light. There are some striking moments of revelation, the heady stuff of proper science fiction. In the end, though, the film seems to me to be mainly about the nature of life and particularly what it means to live well. Several possibilities seem to be offered in the course of the film – does a good life mean the absence of every little inconvenience and problem? Is it the luxurious materialistic hedonism promised by Leisureland’s advertising programme? Is it in taking a longer view and acting in the best interests of humanity as a whole? In the course of the film, the different characters make their choices, and I can easily imagine viewers emerging with differing opinions as to who is right and who is wrong. The film is well-realised, with some striking visual moments, and Matt Damon gives a quietly impressive performance as something of an everyman, someone struggling to find his place in the world. The support from the likes of Waltz, Chau, and Udo Kier is also good. The film has a consistent inventiveness which means it is frequently thought-provoking and occasionally very funny. As you can tell, I was rather charmed by it, and willing to go along on the journey even when it sometimes seemed unclear where the film was taking me. There is much here to enjoy and think about; this is one of the best SF movies of recent years. Yet more proof, perhaps, that in Hollywood nobody knows anything. The various tribes of American cinema (in the form of George Clooney, his regular collaborator Grant Heslov, and the Coen brothers) have come together, and the resulting script has been filmed as Suburbicon, with Matt Damon and Julianne Moore in the leading roles. With such a gallimaufry of talent both in front of and behind the camera, you would confidently expect the movie to be both a popular smash and a contender for critical recognition too. And yet, of course, things have not quite turned out that way. Apparently this is the least financially successful film of Matt Damon’s career, a genuine bomb at the box office, and not exactly loved by people who comment on films for a living, either. The natural question to ask is: what went wrong with Suburbicon? The movie is set in the late 1950s in Suburbicon itself, which is a model community just entering its second decade of existence. It advertises itself as a virtually perfect place to live, a paradise of white picket fences and social harmony. However, the town is rocked by a series of unexpected events – the arrival of its first African-American family, and a brutal murder. This occurs one night when thugs break into the home of mild-mannered local businessman Gardner Lodge (Damon) and take him, his wife Rose (Julianne Moore), her sister Margaret (Moore again), and his son Nicky (Noah Jupe) prisoner. The family are drugged into unconsciousness, and when they awake it is clear that Lodge’s wife is not going to recover. The fact that the Coens are co-credited with Clooney and Heslov on the script for Suburbicon inevitably gives the impression that the four of them spent some time recently round at George’s place, possibly having a barbecue while they tossed ideas for the story back and forth. This is another one of those things which is not as you might expect, for apparently Suburbicon is based on a script they wrote over thirty years ago and then put to one side. One wonders why, for this movie still has a certain Coeniness about it – saying that Clooney is attempting a pastiche of their style is probably overstating it, but it has that kind of slightly off-kilter quality that many of their films possess, as well as the way in which a thriller plotline is combined with the blackest of comedy. Still, you can’t help wondering which bits of the story are original Coen, and which were inserted by Clooney and Heslov. I say ‘original’, but this would still have been an obvious pastiche even if the brothers had stuck with it – there are all kinds of subtle references to the kind of dark suspense stories that people like Alfred Hitchcock and Patricia Highsmith were telling half a century ago. The notion of something very unpleasant incubating behind the all-American facade of small town life inevitably recalls Blue Velvet, too. One thing you can certainly say about Suburbicon is that the plotting of the main story is up to scratch, in its closing stages at least. The film threatens to become a kind of black farce as the bodies pile up, but this never feels forced or contrived. The performances are also strong – Noah Jupe is particularly good as Nicky, who’s the viewpoint character for much of the movie. I’m not entirely sure why it was necessary for Julianne Moore to play both sisters, but she is customarily good, as is Damon. There’s an impressive appearance, in what’s really little more than an extended cameo, from Oscar Isaacs – an able young actor who might do quite well for himself if he could only find a lead role in a high-profile franchise. Much of Suburbicon is clever and inventive and very well made, and yet I can still understand why this film has failed to find an audience: it left something of a sour taste in my mouth as well, despite all its positive elements. I think this is mainly because the B-story of the film represents a serious tonal misjudgement – if I had to bet money on it, I would say this was the main addition to the script made by Clooney and Heslov. It concerns the Mayers, the first African-Americans in Suburbicon, and their treatment by the rest of the town. This is almost cartoonishly ghastly, with mobs assembling outside their house every night to jeer and shout abuse, the town council paying to have high fences built around their property, local shops basically refusing to serve them, and so on. Now, I am sure that this sort of thing really happened in America in the late 50s, and I am by no means saying that it should not be depicted and reflected upon in films set in this period. But I’m not sure juxtaposing scenes of naturalistic drama about appalling racial abuse with a blackly comic suspense thriller entertainment really serves either project especially well. I have a lot of time for George Clooney and generally find myself in agreement with many of the currently unfashionable ideas he often attempts to smuggle into his films, as both an actor and director. But on this occasion he just seems to be trying too hard to make a rather suspect point. As the blackest of comic suspense thrillers, there was a lot about Suburbicon that I admired and enjoyed, but as an attempt to make some kind of social commentary about America, either now or in the 1950s, it badly misfires. Still just about worth watching, I would say, even if it’s not the film it wants to be or the one you might be hoping for. The continents drift along in their stately way, the zodiac processes across the heavens, and the cinematic calendar continues its own slow evolution. When I first got into this ‘paying serious attention to cinema’ game, it was all much simpler: you had serious movies as the majority of releases right up until Oscar Night, at which point the more lightweight fare and genre movies would pop up to fill the gap until the big blockbusters appeared round about the time of Memorial Day in the States. These days, of course, everything is up in the air: the genre movies have been joined by blockbusters much earlier in the year, some of them even before the Oscars have been handed out. It doesn’t help matters that the line between the two appears to become a bit blurred – was Deadpool a genre film or an aspiring blockbuster? How about the imminent Logan, or the new King Kong movie? Or, for that matter, Zhang Yimou’s The Great Wall? The film’s $150 million budget, along with the presence of an A-lister like Matt Damon, would seem to suggest a film with the biggest of ambitions. Set against that, on the other hand, is… well, decide for yourself. The film appears to be set around the 11th century, and opens with European mercenaries William (Damon) and Tovar (Pedro Pascal) leading a small group of adventurers into the remote wilds of the east. (Pascal is allowed to use his native Spanish accent, Damon attempts a rather optimistic, not to mention variable, Irish brogue.) Things look grim when the rest of their party is killed by a weird and mysterious beastie, and hostile local horsemen drive the duo onwards until they encounter something awesome – the imposing sight of the Great Wall of China (which still isn’t visible from space in the 11th century, despite what everyone says)! The Wall is manned by a huge force of soldiers, apparently getting ready to enact some serious slaughter, but exactly what’s going on is not immediately clear, not least because the only senior officer who speaks English, Commander Lin (Jing Tian), is clearly suspicious of them. Her concerns are quite justified, as the Europeans have only come to China to steal the recipe for gunpowder – nor are they the first, for hanging around the place handing out exposition is Ballard (Willem Dafoe), survivor of a previous expedition with the same aim. It turns out that the Great Wall is being manned to fend off an invasion of monsters which (the subtitles assure me) are called the Tao Te, a terrifying horde which arises once or twice every century to eat everything in their path. If the monsters are able to overrun the wall and devour the population of the Chinese capital, they will be well-fed enough to conquer the world! Things look bleak – can William put aside his mercenary, capitalistic principles long enough to join forces with the Chinese warriors in a proper piece of collective effort? This is another one of those films which has received a bit of a savaging from the Diversity Enforcers, on the grounds that it supposedly perpetuates a slightly dodgy trope where a Caucasian protagonist swoops in to save the day for a bunch of incompetent supporting characters of a different ethnicity – the so-called White Saviour stereotype. On paper, you can see why this could be so, but I would argue that fears of this sort are groundless, for two main reasons. Firstly, the film is largely the work of Chinese film-makers, with the distinguished director Zhang Yimou in charge, and Matt Damon is in this film for basically the same reason that Donnie Yen and Jiang Wen showed up in the last stellar conflict franchise brand extension (it shares one of the same writers, by the way) – to guarantee global ticket sales. The Caucasian presence is a business decision, not anything ideological. 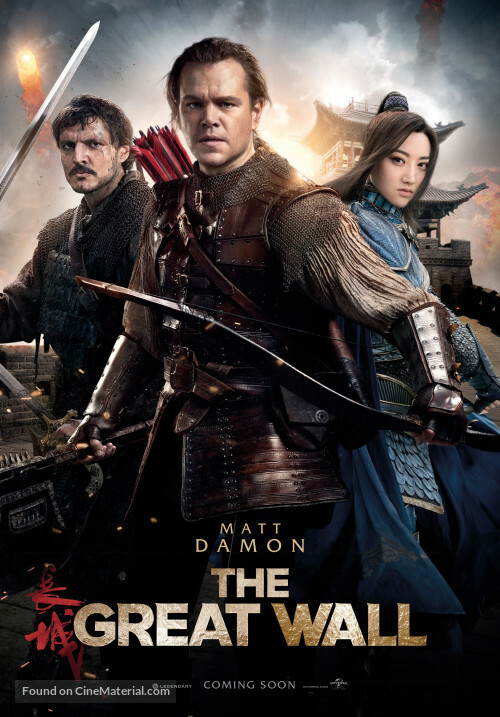 And, secondly, IT’S MATT DAMON ON TOP OF THE GREAT WALL OF CHINA FIGHTING ALIEN MONSTERS WITH A BOW AND ARROW. GET A GRIP ON YOURSELVES AND STOP TAKING THIS FILM SO SERIOUSLY. I mean, really. There’s a time and a place to get righteously indignant, but doing it with this film just makes you look silly. Actually, I’m genuinely unsure what kind of film this is supposed to be. It starts off not a million miles away from The Man Who Would Be King, in terms of the two main European characters and the tone of their relationship. But as soon as we reach the Wall itself, with its battalions of primary-coloured troop-types and CGI as far as the eye can see, it starts turning into something rather less interesting and more superficial. And once the major VFX sequences start rolling, with Starship Troopers-style swarms of monsters scuttling over the horizon (the script suggests these may genuinely be aliens), and female soldiers bungee-jumping off the top of the Wall to stab the monsters with spears… well, it’s like a cross between some kind of garish computer game and a comic book, and not an especially interesting one. The characterisation is pretty thin, the CGI about as persuasive as Damon’s Irish accent, and it has none of the class or sophistication of the other films I’ve seen from Zhang Yimou, for all that it has the same underlying principles and fascination with colour as movies like Hero and House of Flying Daggers – I’m kind of reminded of Ang Lee’s Hulk, as another example of a director best known as an art-house darling taking a crack at something much more mainstream and just not quite being able to hack it. 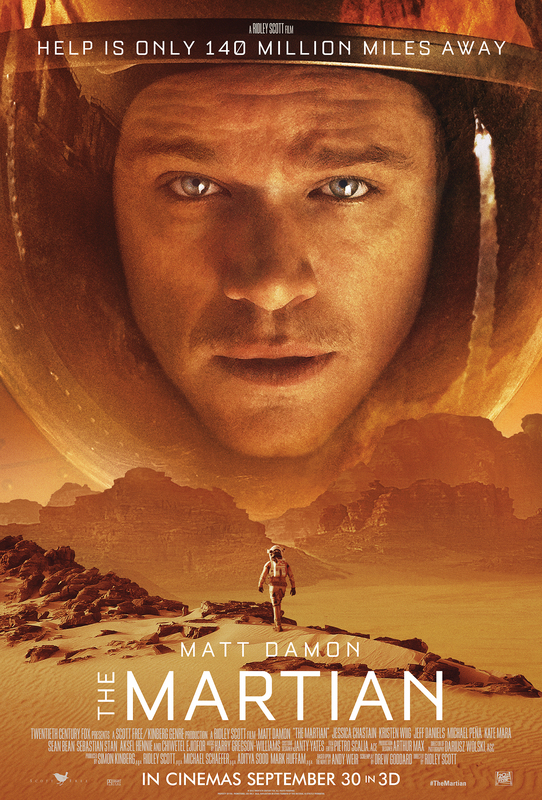 Not that this is Matt Damon’s finest hour, either: there may be a Chinese expression that describes just how far out of his comfort zone Damon visibly is for most of this film, but it certainly doesn’t exist in English. To be honest, this looks like the kind of knowingly silly, CGI-heavy piece of fluff that should be starring a wrestler or possibly Gerard Butler, so the presence in it of proper actors is one of the most bemusing things about it (Andy Lau is also in the cast, by the way). But it’s just an odd, odd film overall, not really compelling as an American action movie or a Chinese fantasy. It neither convinces nor persuades, nor does it grip or thrill. But on the other hand, it’s mostly just silly rather than being actually bad, and of all the great walls currently being unleashed on the world, this is not the one people should really be complaining about. So, DC are releasing an antihero-themed wannabe-blockbuster and there’s a new Bourne sequel with Matt Damon in the cinema too: cripes, it’s like I’m back in August 2004 all over again. (I wonder if it’s possible to leave myself a note not to bother going to see Transformers? Somehow I doubt it.) I suppose this is a timely reminder that some things never really change. I suppose the key thing this time around is that Jason Bourne is the first film about that character in nine years, Damon, director Paul Greengrass, and Bourne himself all having excused themselves from participating in Tony Gilroy’s rather disappointing crack at a Bourne-free Bourne movie, 2012’s The Bourne Legacy. As I always seem to be saying, it took me a while to warm up to this series, and my review of the original 2002 movie is virtually the textbook case of my getting it very wrong indeed, but the prospect of a new outing from this team was always going to be a very enticing one. Well, if you liked the previous Damon/Greengrass Bourne films you’re probably going to like this one, too. There is a sense in which it perhaps feels a bit formulaic in terms of the way the plot develops, but not to the point where it seriously impairs the film as a piece of serious entertainment. After the resounding phrrppp of the Jeremy Renner movie, it’s actually quite reassuring and cosy to find a film which hits so many of the familiar series beats: beady-eyed CIA analysts poised over computers, ‘Bring the Asset on-line,’ internet cafes, Matt Damon stalking purposefully out of airports and railway stations, ‘Eyes on target’, some wistful cor anglais during the character beats, a spectacularly destructive final chase sequence, Bourne displaying the kind of ability to soak up punishment normally only associated with Captain Scarlet or possibly Popeye the Sailor, Extreme Ways playing over the closing credits and so on. It doesn’t even matter that much that most of the characters are basically stock figures by this point – there is the grizzled CIA veteran (Tommy Lee Jones this time), the ambitious young operator (Alicia Vikander this time), and the fearsomely professional rival assassin whom Bourne is clearly going to have to engage in a deadly contest of skills at some point (Vincent Cassel this time). I would happily turn up to any film featuring all these things, but the thing about the Bourne films was that they always had a bit more about them than the average action thriller, and the question is whether the new film has any reason to exist other than to profitably rehash elements of a well-regarded film franchise. Well, the jury is still thinking about that one, I suspect, for the plot of the film feels ever so slightly slapped together: the first two thirds are primarily about Bourne’s own past and his father’s hitherto-unsuspected role in the creation of the Treadstone Project, which feels more or less natural and justified – but for the final act and the climax they segue into an essentially unconnected plotline about internet privacy and the CIA infiltrating social network providers. This is the kind of hot-button topic that Paul Greengrass is clearly strongly drawn to, but it is a bit of a wrench given what precedes it, to say nothing of the fact that this kind of malevolent ubiquitous cyber-surveillance was the underwhelming Maguffin at the heart of SPECTRE, too. I mean, this is still a superbly accomplished thriller, and miles better than the Renner movie, even if the major set pieces aren’t quite as stupendous as the ones in the previous films. The thing is that it doesn’t feel like it has the heart and soul of those films – it’s kind of searching for a reason to exist, which I suppose is Bourne’s own quest, but even so. 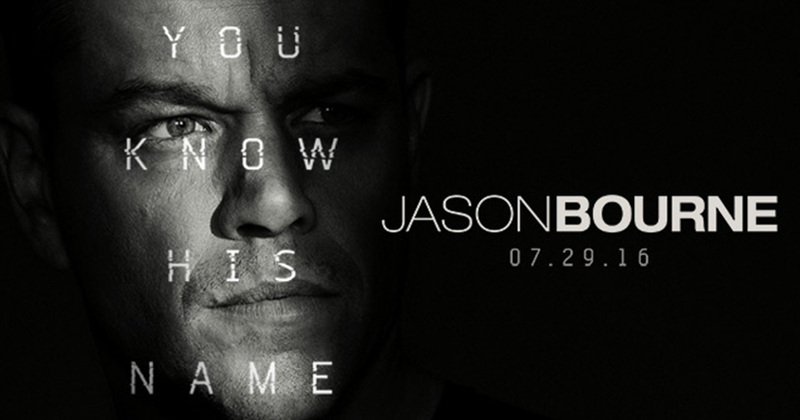 As I said, it all feels just a little bit like a remix of the Bourne series’ greatest hits, something rather formulaic. Luckily, it’s a brilliant formula, and the result is a very satisfying piece of entertainment. The problem is that it’s inevitably going to draw comparisons with two of the very best thrillers of the last 15 years, and it simply isn’t quite up to the same standard. It says something about the older movies when the fact that this one is only a very good thriller qualifies as a disappointment. Rather unexpectedly, we seem to have found ourselves in the middle of an Officially Recognised Golden Age of Space Movies (if only there was a convenient way of referring to it suitable for a family readership). Even NASA seem to have cottoned on to this, timing their recent press announcement of the discovery of salt water on Mars to coincide with a peak of media interest in the red planet – mostly courtesy of Ridley Scott and his chums, whose new movie The Martian is hitting screens even as I type. Ridley Scott’s track record when it comes to SF movies is… well, let’s just say I’m less of a fan of them than many people, but even so they are invariably never less than interesting to watch, and I’ve been a bit of a sucker for hard SF about Mars since reading Kim Stanley Robinson’s Trois Coleurs trilogy many years ago. And one should always make the best of a golden age of anything while it lasts. Based on Andy Weir’s novel, The Martian opens with an American mission already in situ, commanded by Jessica Chastain and featuring a number of moderately well-known faces (Michael Pena, Sebastian Stan, Kate Mara, that sort of people) amongst the crew. Inclement Martian weather (i.e. a colossally violent sandstorm) forces an early evacuation of their outpost, but in the chaos mission botanist Matt Damon is struck by flying debris. With all contact lost, Chastain is forced to leave without him, believing him dead. Well, it’s an unfortunate fact that Matt Damon’s service record when it comes to long-haul one-man deep space missions is not entirely unblemished, even when Jessica Chastain is involved, but even so, this is the kind of movie which leads sensible people to say things like ‘It’s hard to imagine Matt Damon making a bad film’ (Stuck on You and The Brothers Grimm clearly don’t linger long in the memory). The Martian may rest very comfortably in the same subgenre as Gravity and Interstellar, but I suspect it’s a more certain crowdpleaser than either of those. Despite all this, it remains an extremely likeable and accessible film. This is largely due to the presence of the always-engaging Damon in the central role (he does, after all, have to carry lengthy sections of the film unaccompanied), but also the result of a script which works extremely hard to put a human face on the story. On one level this works simply as an adventure story about the power of human ingenuity and the will to survive, and it’s a good one: it’s really rather refreshing to find a film with such an upbeat view of humanity, without a single really unsympathetic character, especially when it works so well as a story. The film-makers work hard to fill the movie with little moments of lightness and humour, many of them arising from an unexpectedly eclectic soundtrack, including performers like Abba, Hot Chocolate, and David Bowie (not even the song you might be expecting, either). A strong supporting cast including the likes of Sean Bean, Jeff Daniels, Kristen Wiig and Chiwetel Ejiofor (who I note has ascended to the point where he qualifies for the ‘and’ position in the credits) helps a lot, of course. Even as I was watching the film, and thoroughly enjoying it, I couldn’t help but find myself reflecting on the fact that the more science you put into a movie, the more certain it is that you’ll make tiny slips or compromises in the service of the story, and the more criticism you’re inevitably going to draw from the very same nerdy audience you were trying to satisfy in the first place. Both Gravity and Interstellar drew more of this kind of nitpicking than they really deserved, and I don’t doubt that some of The Martian‘s more striking plot twists will be savaged in the same way. Oh well, there’s no pleasing some people. Speaking for myself, I found The Martian to be much more enjoyable than I would ever have expected a Ridley Scott-directed SF movie to be. The film is immaculately realised and – in terms of its setting – thoroughly plausible, but, more importantly, Scott seems wholly focused on simply telling the story, rather than dwelling on landscapes and set dressing. I might even go so far to say that this is challenging the director’s cut of Kingdom of Heaven as my favourite Scott movie. As I said, The Martian sets out to be a number of things – a convincing piece of hard SF, a full-blooded adventure story, and a character study in human resilience, to name but three. Does it succeed perfectly at all of these things? No, not really – but it comes close enough to be considered a terrific achievement as a piece of film-making. It is sure to be lumped in with Gravity and Interstellar when people talk about this type of movie – but for once, the comparison is entirely justified. This is a seriously good, seriously entertaining film. I like George Clooney. I’ve enjoyed his screen performances ever since the first movie I saw him in, which was From Dusk Till Dawn, far too many years ago for me to comfortably contemplate. I even didn’t think he was too bad as Batman, though the film in question is another matter. I have come to admire him all the more following his reinvention of himself as a progressively-inclined hyphenate, making a series of impressively entertaining and intelligent films like The Ides of March, Good Night and Good Luck, and Confessions of a Dangerous Mind. I will give a sympathetic hearing to anything he cares to promote in my direction. 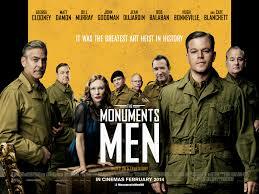 And the trailer for his latest project, The Monuments Men, makes a good, stirring pitch, for what looks like it’s going to be a rousing, old-fashioned movie with the best of ideals at its heart. In addition to writing, producing, and directing the film, Clooney plays Frank Stokes, a senior art historian who makes a heartfelt pitch to the US government: the year is 1943, and the outcome of the Second World War is no longer in doubt. However, the months ahead will see the majority of Europe’s greatest cultural treasures placed in desperate peril as the war rages around them – to say nothing of the standard Nazi procedure of stripping any significant cultural items from any territory they occupy. The full-blown war movie has gone a little out of fashion these days, and The Monuments Men is by no means what you’d call an action adventure. Instead, it is more of a comedy-drama, albeit one motivated by the noblest of concerns – in interviews, Clooney himself has said it originated out of his own desire to make a film which was not, on some level, a cynical one. As I said, I like Clooney, and I’m all for idealism, and if the film is arguing for the vital importance of culture as part of the bedrock of civilisation, then I’m absolutely with it all the way – but while The Monuments Men has some moments of real quality, on the whole the film is a bit of a disappointment when compared to some of Clooney’s previous work. The trailer is great at pitching the central premise of the film – a sort of high-minded amalgam of The Dirty Dozen, Dad’s Army, and (possibly stretching a point) The Da Vinci Code – but the movie itself is less successful at turning the premise into a satisfying narrative. For one thing, I get the impression that this movie is rather less of an epic than Clooney would have liked it to be, clocking in at a smidge under two hours, and the main consequence of this is that the whole putting-the-crew-together element of the story is raced through in the course of the opening credits. As a result, the early scenes of banter and camaraderie take place between a bunch of people we don’t actually know that well, and the effect is rather like going off on an adventure with a bunch of complete strangers. In this kind of film the first act is everything, and the film never quite recovers from this bumpy start. The movie also struggles to accommodate the sheer scope of the story it’s trying to tell – as the characters admit at several points, the numbers involved are mind-boggling, and the story ranges across practically the entirety of western and central Europe. Forging a coherent narrative out of all this proves extremely difficult. In the end the film opts to focus on the hunt to rescue a few particularly significant pieces of art, with some other episodes woven into the story, but the final effect is still that of a film which is a collection of disparate bits and pieces. Some of these are effectively funny, or moving, or tense, but they don’t quite cohere into a really great film. Perhaps it’s just that the ideas which The Monuments Men is trying to explore are too big and abstract to lend themselves to a film of this kind. Certainly the movie itself seems unable to quite decide on what its central message is – ‘Watch yourselves! No piece of art is worth your life!’ Clooney warns his team as they disembark in Normandy, but by the end of the film he’s stating the exact opposite to justify some of the sacrifices made in the course of the story. Hmmm. Inevitably, when dealing with the issue of cultural obliteration during the Second World War, the spectre of the Holocaust is raised at several points in the course of the film, but it never quite comes up with a way of really engaging with this beyond an uncomfortable, reverent silence. Still, the performances are good and it’s well mounted, and it’s not what you’d actually call a bad film – it just really struggles to convert its good intentions and big ideas into the meat and drink of narrative film-making. I won’t deny it was a bit of a disappointment to me, but I still wouldn’t describe it as a bad film – average, more than anything else. One of Clooney’s minor works, I suspect, but still laudable on many levels. When someone comes straight out of the trap and makes a brilliant, brilliant film at the first attempt, you’re naturally delighted, but also perhaps a little wary: could they have peaked too soon? How can they live up to the weight of expectation thus created? This was kind of how I felt when Neill Blomkamp announced himself to the world with District 9 four years ago: one of the great SF movies of the 21st century. Now he has returned with Elysium, a film which – if we’re honest – perhaps cleaves a little too closely to District 9 in terms of its content, theme, imagery and style. On the other hand, this is a major studio release with a big budget and A-list stars, and an accordingly conventional feel in places: which is to say that in places it quotes liberally from the Big Book of SF Cliches, starting with the voice-over explaining how the world went to rack and ruin in the latter part of the 21st century. By the mid 2150s anyone with money and sense has left the planet and is resident on Elysium, a space habitat in Earth orbit, where they all live the life of Riley with swimming pools and non-stop garden parties. Down below on Earth, of course, no-one has even seen a cucumber sandwich in decades, with the majority of the population trapped in vast, squalid slums while a lucky few toil away in degrading, menial jobs. The proles are policed by brutal robot enforcers, backed up by the occasional human operative. Anyway: our protagonist is Max (Matt Damon, who – bemusingly – was only offered the part after Eminem turned it down), a petty crook turned factory worker. Once he had dreams of moving to Elysium himself along with his friend Frey (Alice Braga), but now he has accepted that it’s just not going to happen and his life is essentially worthless. However, receiving a fatal dose of radiation in an industrial accident leads Max to reconsider this – he has only days to live, unless he can avail himself of the miraculous medical assistance available up on Elysium. But how to get there? Hooking up with an old pal who still has underworld connections, Max agrees to take on the dangerous job of stealing the contents of the brain of a top Elysium tycoon, in return for which he will be smuggled up to the Orbital. It’s a lot less like Inception than it sounds, I promise. What follows is somewhat complex, mainly due to the political machinations of Elysium’s icy security chief (Jodie Foster) and the violent excesses of her chief agent (Sharlto Copley giving another eye-catching performance), and not without a few improbabilities along the way. But in the end, in many ways it adheres to the District 9 template, in that it is a serious, good-looking SF movie with striking visuals, fun gadgets and technology, and a nice line in violent mayhem. What’s missing is the black humour and the wit and invention of the earlier movie – convoluted though the story gets, the actual throughline in terms of characters arcs is very straightforward, and I guessed the ending about halfway through (and it isn’t even as if I sit there trying to anticipate these things). 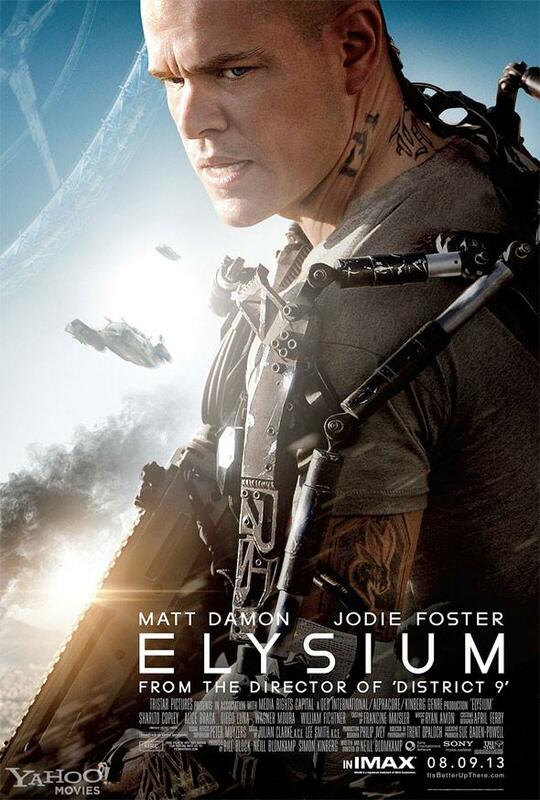 I suppose that in the end, part of my dissatisfaction with Elysium stems from the slightly hackneyed script, but also because the film does that mildly annoying thing of not wanting to be just a dumb SF action film and then never quite following through on its ambition. It’s a bit like In Time in that you don’t need to be John Clute to figure out that the movie’s world of haves and have-nots, with limitless medical care and support for a few and barely anything for the rest (and the differences between life on Earth and that on the Orbital and presented almost solely in terms of the healthcare available), is a thinly-disguised commentary on the state of healthcare availability in much of the real world. You’re never in doubt that where the film’s heart is at – like any other decent person with a brain and a soul, Blomkamp clearly thinks that free universal healthcare should be a no-brainer for any civilised society worthy of the name. And yet for a film apparently aspiring to address a real-world problem, it doesn’t have anything to offer in terms of real-world solutions. The film’s argument in favour of universal healthcare is almost entirely sentimental, and implied at that – the plot is actually resolved by a big action sequence, a Maguffin, and some computer hacking. Quite what’s going to stop the original status quo being restored PDQ is not made clear, unless the characters at the end of the film are now living in a socialist state governed and enforced solely by machines: an unusual conclusion for an American-financed SF blockbuster, to say the least. I think I’m being too harsh on a film which is well made, directed, and acted, and the sentiments of which I broadly agree with. And, after all, Elysium is a big-budget socialist cyberpunk movie, which manages to comment on the state of the world’s healthcare while still including men in cyborg exo-skeletons having fistfights in space. So it has a certain sort of uniqueness to its credit, if nothing else. 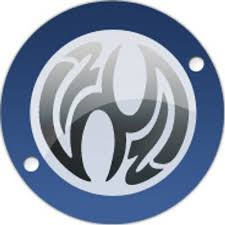 Creditable: that’s a good word for Elysium. It’s no District 9, certainly: but it’s a lot better than the likes of the Total Recall remake, too. I would applaud it for its ambitions rather than dismissing it for failing to realise them perfectly.